Elliptic Curve Cryptography (ECC) is an approach to public-key cryptography, based on the algebraic structure of elliptic curves over finite fields. ECC requires a smaller key as compared to non-ECC cryptography to provide equivalent security (a 256-bit ECC security have an equivalent security attained by 3072-bit RSA cryptography). co-efficient field is equal to 2 or 3). In general, an elliptic curve looks like as shown below. Elliptic curves could intersect atmost 3 points when a straight line is drawn intersecting the curve. 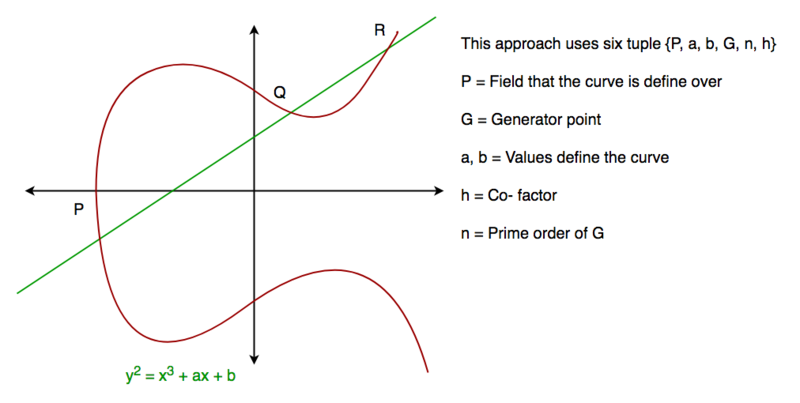 As we can see that elliptic curve is symmetric about the x-axis, this property plays a key role in the algorithm. communications while exchanging data over a public network using the elliptic curve to generate points and get the secret key using the parameters. For the sake of simplicity and practical implementation of the algorithm, we will consider only 4 variables one prime P and G (a primitive root of P) and two private values a and b.
P and G are both publicly available numbers. Users (say Alice and Bob) pick private values a and b and they generate a key and exchange it publicly, the opposite person received the key and from that generates a secret key after which they have the same secret key to encrypt. Step 7: 9 is the shared secret. This article is contributed by Souvik Nandi. If you like GeeksforGeeks and would like to contribute, you can also write an article using contribute.GeeksforGeeks.org or mail your article to contribute@GeeksforGeeks.org. See your article appearing on the GeeksforGeeks main page and help other Geeks.